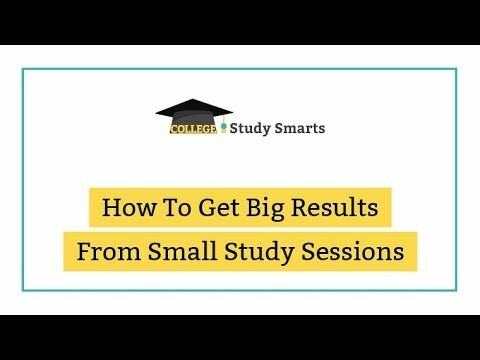 We all need to maximize small study sessions for big results. I’ve talked about the idea before with the Pomodoro technique, and Study Less with Study Smarts. Today I want to talk about how we manage our attention and intention to get big results. Do you find yourself spending a LOT of time studying but not getting the results or grades you want? If so, you may need to focus on attention management, not time management. When we focus only on the time to complete a task, we still may not get the results we want. Meaning, you might not finish what you intended or you may not produce your best work. Each day there are millions of stimuli vying for attention. Our brain is really good at tuning out most stimuli so we can function, but there is still a vast amount we willingly allow in (though maybe not consciously). We turn on the radio in the car while our phone beeps updates and the kids ask questions. It’s a lot to take in! How we manage attention in our studies is crucial to the results. If you can learn to manage your attention, managing time will not only take care of itself, you’ll have a massive competitive advantage over most people. Attention management is an intentional focus on where we put our efforts and attention. This has huge implications for you as a student. You are balancing a lot with school, work, families, and friends. To manage all of these areas of life you have to squeeze every ounce of productivity out of your study sessions by avoiding distractions and knowing what you want to achieve before starting. can you benefit from attention management? Is your study time spontaneous? When you sit down to study, are you winging it without a plan of what you will achieve? While studying do you have tv, radio, social media, phone on? Do you multi-task while studying? After a study session do you immediately move to the next activity? If you answered yes to any of these questions, then attention management could be the approach you need to start getting more with your small study sessions and stay on top of your school work. Being intentional with small study sessions means deciding ahead of time what to achieve, setting a time limit, managing our focus while studying, and doing a quick recap to adjust your approach for the next study session. Don’t worry if this feels like a lot because I have a free quick printable worksheet to help you quickly outline everything here and keep yourself on track. It will take one minute to work through and the results are big. If you are trying to study whenever you can and don’t have a daily plan, grab this free study planner and be intentional. Start with a 30-minute study session every day. No matter what you have going on in life, I guarantee there are 30 minutes in your day to devote to study. You need to choose only one thing to focus on for your study session. This ensures you are able to complete it and also help you work efficiently and stay focused. We aren’t wired to multi-task, and I read recently those who claimed they were best at it performed worst in studies. 🙂 Stick with what your brain is good at and focus on one goal. When you know what you want to accomplish, set a reasonable time limit for yourself and prepare everything you need. If you need to take notes, do you have paper or your computer? Need to watch a video? Do you have the link and an internet connection? A few seconds of planning ahead can save you tons of time being stuck without the tools you need. Speaking of tools, here are some of my favorite study supplies. Now you know exactly what to do and have everything necessary to get started. So start! cut out distractions and turn off the tv, radio, video games, etc. Then during your study session stay focused on your goal and only your goal. This means avoiding multitasking at all costs and ignoring everything not helping you reach your goal. This singular focus is how you accomplish big results from small study sessions. If you have a hard time getting started, check out three tweaks for those that hate studying. What will you do differently in the next study session? Commit to applying this level of focus to your study sessions for one week and see phenomenal results. If you would like some guided help to start working through small study sessions on a regular basis, take the free 7-Day Study Challenge. It’s based on two very short study sessions daily and is a great way to build daily habits you can then optimize. Take a look at some of my favorite resource and tools for students. Plan a 20-minute study session today. What is one goal you will accomplish? Download the intentional study worksheet and get started. Leave a comment below and let me know if you were able to achieve your goal! This also works at a PhD level! Especially the “knowing what you want to achieve before starting” part. I find the reading process much more fruitful when I ask a question every time I analyse something for my literature review. I completely agree. When you are clear about what you want to achieve you are much more likely to accomplish it. Asking yourself questions is a great way to stay engaged with the reading.